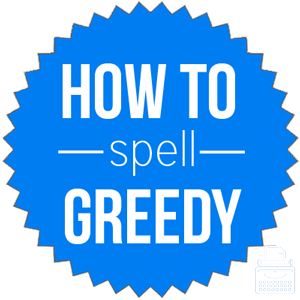 Spelling of Greedy: Greedy is spelled g-r-e-e-d-y. Definition of Greedy: Greedy describes someone or something that is selfish and/or desires much wealth, many possessions, or great fame. Greedy may also refer to someone who has a strong want for food and drink. Pronunciation of Greedy: Greedy is pronounced gree-dee. It rhymes with preedy, speedy, needy, and seedy. What does greedy mean? Greedy is an adjective that describes someone or something that yearns for a lot of something—food, drink, fame, wealth, possessions, attention, etc. A greedy person does not typically want to share what he or she has or receives. There’s more than enough for everyone so there’s no need to be greedy. The greedy king had all he needed and more, yet most of his people lived in utter poverty. Greedy comes from the root word, greed, which is a noun that refers to the selfish and excessive desire for something. The greed and oppressive rule of the leader made him seem more of a dictator than a representative of the people. Sometimes, excessive greed makes people do horrible and harmful things. The adverb, greedily, is formed by adding “-ily” to the noun, greed. Greedily describes the way in which a person performs an act with selfish or excessive desire. He greedily reached for the appetizers and devoured them all. The politicians greedily eyed the organization’s financial success and prestigious reputation. The word greedy was first used before the 12th century, according to Merriam-Webster’s. Greedy comes from the Middle English word gredy, which comes from the Old English word graedig, which is related to the Old High German gratac, meaning greedy. There are several synonyms for greedy, but some can only be used in certain situations. The following synonyms are words that can be substituted for greedy when it refers to someone who has an excessive want for food and drink. Greedy is an adjective used to describe someone who has an intense desire for power, wealth, possessions, fame, food, drink, etc.